Will #SquatForChange Finally Bring Diaper Changing Tables to Men’s Bathrooms? Donte Palmer, a father of three, had been running errands with his 1-year-old around St. Augustine, Florida, when he ended up at a Texas Roadhouse — and found himself in urgent need of a changing table. There wasn’t one in the men’s room, so he did what he had to do. The post found its audience and quickly spread. Think about the thigh strength alone you’d need to balance for as long as it takes to change a diaper: One estimate suggests it takes five minutes from start to finish. A typical 1-year-old, who won’t be potty trained yet, will need, on average, about eight diaper changes a day. Sure, you won’t be changing that many while out at dinner, but as any parent knows, predicting how many of those will happen in a two- to four-hour span of time is like trying to pin down the wind. Not only is sustained squatting one of the most difficult exercises, but most people aren’t looking to squeeze in a workout when they simply need to get a squirming child out of a poop-filled diaper and back into the grocery store, movie theater or shopping mall. #SquatForChange as a stay at home dad I've been complaining about this for years. Had to leave a restaurant and walk to a movie theater for a family restroom. Get with the program society!!! 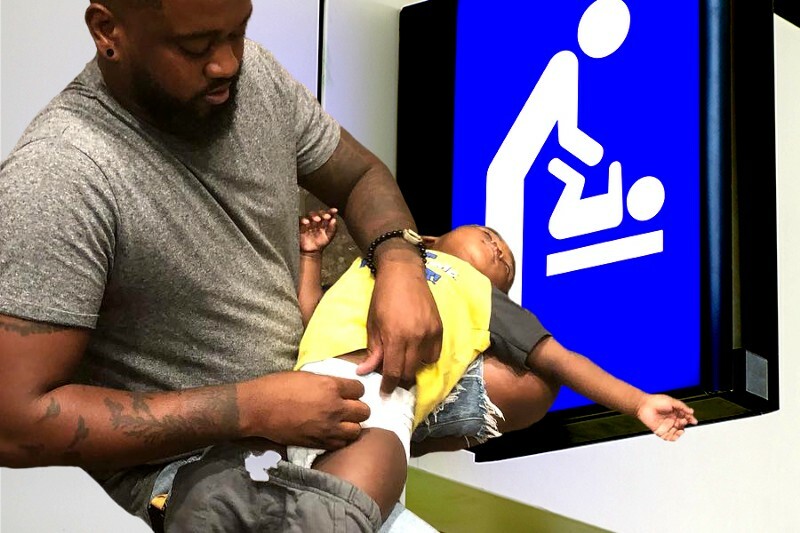 @Pampers would love to see you take a leadership role in the #SquatForChange After all, the dad, Donte Palmer, said his kid "needed a Pamper change" https://t.co/jfhGC9nSz4 Help dads out w/ changing tables! This is something that I never knew was an issue until I became a father, myself. It's incredibly frustrating when I need to change a diaper when I'm out and about and there's no changing table in the men's restroom. Last year, we wrote about why men’s restrooms still lack changing tables in spite of the pleas of fathers around the country. The CDC found (in 2010) that dads change diapers every day or several times a week. Other research suggests 65 percent of fathers are in on the diaper change. President Obama passed the BABIES Act in 2016 — Bathrooms Accessible in Every Situation — but it only applied to public restrooms in federal buildings (courthouses, post offices, etc.). Fathers have pushed for changing tables in their own communities and seen success. Last year, Oregon father Clint Edwards pressured his church to add a changing table to the men’s room, and it did. Ashton Kutcher has used his celebrity platform to call out major retailers for not accommodating dads. Some of them have acquiesced: Macy’s did; coffee chain Tim Horton’s did. Some states, such as Maryland, are introducing legislation to require changing tables in state-owned buildings. And metropolitan areas are following suit: New York City passed a bill requiring all new construction with public restrooms to add them to both men’s and women’s facilities and became the first U.S. city to do so. It’ll be a blessing to all parents: Plenty of women’s restrooms still lack changing tables too. Therein lies the rub of the diaper ointment: The world doesn’t always cater to families, but when it does, it still leans heavily on an outdated notion that it’s women’s work to tend to the family. For their part, Costco agreed to add family changing stations to every store, and claimed they’d been installing changing tables in men’s and women’s restrooms since 1995. But not everyone has jumped on the changing-table bandwagon. California finally passed a bill last year after two vetoes of similar bills, requiring at least one baby changing facility for men and women in any state or local agency, as well as any public venue (movie theaters, grocery stores, restaurants, sporting arenas). But like the bill in New York City and the BABIES Act, it also only applies to new construction or significant renovations, meaning any old places will remain exempt. Part of the issue is that men have really been changing diapers for only about 25 years at this point, and bathroom design simply hasn’t caught up. As the Atlantic discovered last year, providing changing tables in public has largely followed parenting trends. They weren’t routinely added to public restrooms until the 1980s for women, either, who also used toilet seats, back seats, car trunks and filthy bathroom floors to get the job done. In part, it took urban planners simply realizing that mothers were spending less time out in public and keeping their dollars in their pocketbooks because they had to lug the entire family operation home every time someone had a full diaper. By the 1980s, there’s an influx of working and newly single mothers running errands and spending time in public spaces, children in tow. As a result, shopping malls, airports and restaurants would realize the opportunity: The more inviting you make any capitalist enterprise for families, the more time (and money) a parent will spend on your turf. But if Palmer’s viral squat and the attention it’s getting mean anything, then perhaps we’ve reached that moment for fathers. Droves of men out in public with children, in need of a comfortable place to change a diaper, are good and pissed — and instead, taking their children, and their money, elsewhere.